My son is in USA and they cook quinoa regularly. My DIL brought this for me when she came here. Nowadays, I substitute this for cereals and replace it for rice. It is quick and easy to cook. Most of you would be familiar with quinoa. And, to those who want to know about it, Quinoa (pronounced as kinwa / keen-wah) is referred to as a 'supergrain'. It is a grain crop grown for its seeds, cultivated widely in South America. It is actually the seed which we cook. It is high in fiber and has high protein and a complete food in itself. Quinoa is also packed with calcium, potassium, dietary fibre and essential amino acids. The unsaturated fat and the lowest carbohydrates than any other grain makes it a 'superfood'. This makes it an ideal food for diabetics as it is gluten free. It is said to be beneficial for people suffering from migraine headaches also. To know more about quinoa, google about it or see wikipedia. Not keen on quinoa yet? Try it out now. I will post some quinoa recipes in the days to come. And now the basics.. It is like cooking rice. Wash the seeds a couple of times, preferably 3 or 4 times, otherwise, the grains can be bitter. The ratio is 1 cup of uncooked quinoa to 2 cups of water / vegetable stock. Combine 1 cup of quinoa with 2 cups of water or vegetable stock in a saucepan or vessel. Bring to a boil. Turn heat on low, cover and cook for 15 minutes. Switch off the stove, keep it covered and after 5 minutes, fluff with a fork and serve. Quinoa is perfectly cooked when each grain is translucent and the sprout is visible. Alternatively, just follow the cooking instructions on the pack you buy. It comes out perfect. Quinoa can be pressure cooked and can be cooked in a rice cooker as well. What is the tamil name for quinoa and where is it available? No tamil name to my knowledge. Quinoa is NOT thinai. Quinoa is seed. Thinai is millet. Thinai is light yellow in colour and looks different from quinoa. 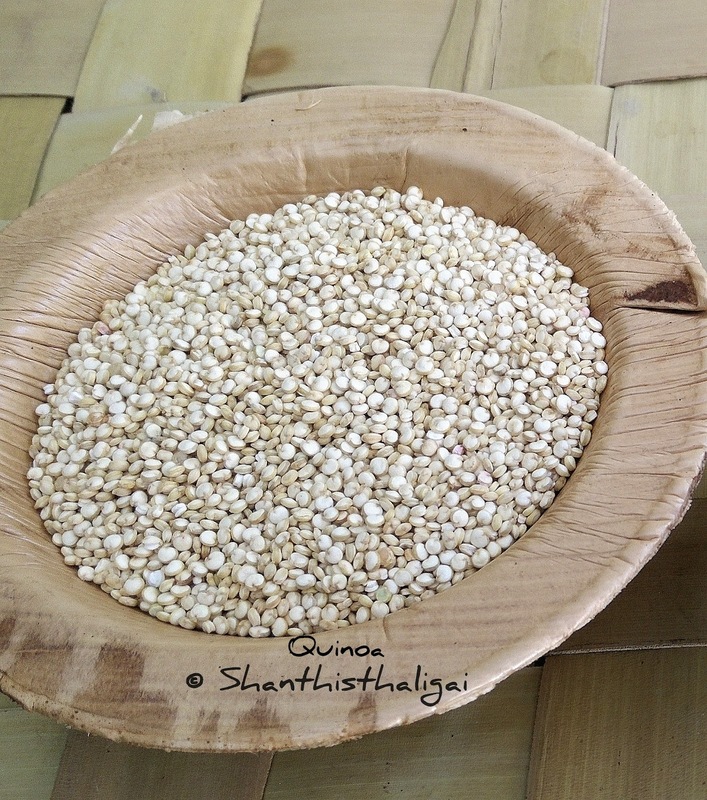 Thinai and other millets are beads like grains, whereas quinoa is like a flat seed in appearance. Google and many people say different tamil names though. This is a foreign crop, and if you are so fond of tamil name, you can say it as 'seemai thinai' (சீமைத்தினை). Seemai in Tamil means 'foreign', thinai in English is 'foxtail millet'. 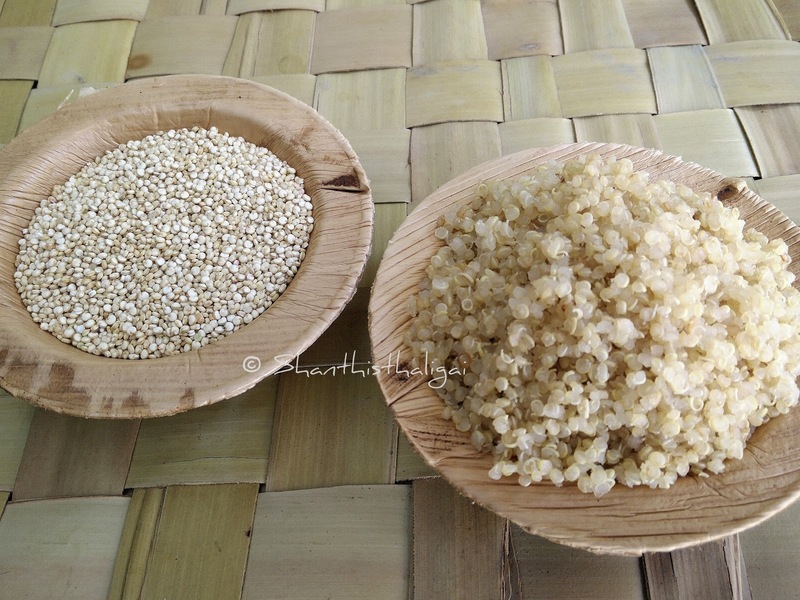 'Seemai thinai' means foreign crop similar to thinai. But organic shops say 'Quinoa' only. Quinoa is very expensive in India. White quinoa is available in all organic stores in India. White, red and black quinoa are also available. 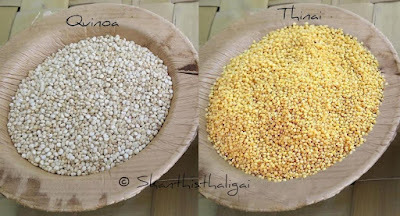 How to cook millets can be seen here. Scroll here for Millet recipes. It is good to soak quinoa overnight(or atleast 7 hrs), drain the water and cook in fresh water to remove phytic acid /saponin from quinoa which causes indigestion for many people. Or dry roast quinoa lightly, rinse and boil it in good amount of water and filter the water. This way also helps to remove phytic acid as well as to get fluffy quinoa. One more tip to turn quinoa aromatic is, after rinsing, roast quinoa in a tsp of pure cow's ghee for 1 cup of quinoa for few minutes on low flame and then cook in water. This gives a nice aroma to cooked quinoa.